Indonesia once is the unique OPEC nations from Asia. The proven oil reserves, ranking 20th in the world; the proven gas reserves, ranking 7th in the world. With more and more China-Indonesia cooperation in oil gas exploration & drilling, oilfield equipment supply, crude oil imports & exports, Indonesia company focus on drilling rigs, solids control equipment, mud pump with super quality and competitive price. GN Solids Control as the 1st API certified solids control equipment private company, is the first private company to enter Indonesia market. After that, more and more Indonesia customer ( Big customers like PDSI,Apexindo,Bermindo etc) shift to GN Solids Control Equipment and gradually to use less US brand solids control equipment with highly cost. One unit drilling fluids mud cleaner with 2 pcs desander cones & 12 pcs desilter cones & one unit deck shaker with 3 panel shaker screen. One unit drilling fluids vacuum degasser with self-contained unit & level sensor to protect over suction of drilling fluids. Except for Solids Control Equipment, GN also exported drilling waste management equipment to Indonesia national oil company, Pertamina. The equipment including Hi-G dryer shaker as 1st step drilling cuttings drying pocess equipment, high speed decanter centrifuge as 2nd step drilling cuttings drying process equipment. After the drilling cuttings dried by Hi-G dryer & decanter centrifuge, the usable drilling fluids can be recovered and go back to solids control system. If the drilling finish and no need back to mud circulation, flocculent unit and dewatering centrifuge is necessary for further treatment. 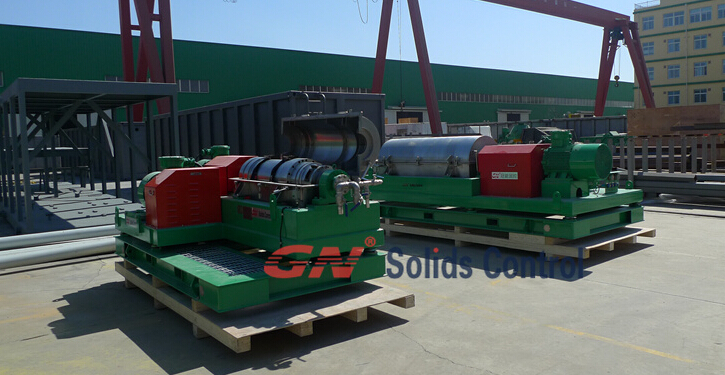 GN can also offer the dewatering unit with dewatering centrifuge.